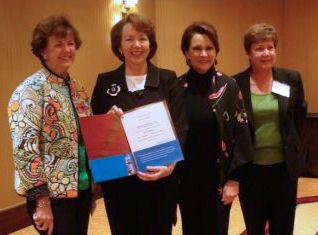 A few bold and pioneering women recognized the potential for ARCS® Foundation in Utah in 2009. They set about launching the Utah Chapter, dedicated to enhancing America’s national and local capacity for research and innovation in science and technology by financially assisting students who demonstrate high scholastic ability. Orientation and information sessions were presented by National Board members Judith Miller, Vicki Griffin and Darla Mueller during February through April 2009. Interested women were recruited, leaders for the Chapter began to emerge, and our kick-off event was held on June 30, 2009, at the home of University of Utah President Michael Young, with over 50 people in attendance. In addition to Dr. Young, speakers included Engineering Dean Richard Brown, ARCS National Board representative Judith Miller, Utah Chapter President Cece Foxley and Dr. Siam Oottamasathien, an ARCS Scholar alum from the University of Colorado and currently assistant professor of Pediatric Urology and director of Pediatric Urology Basic Science Research at the University of Utah.